One more SUV from Asia comes in a form of Toyota RAV4 2015. Toyota has a long tradition of quality auto making. This particular model has a 20 years long history, ever since 1994. It was imagined as a vehicle which will suit all, with increased cargo space, option for a full time four-wheel drive and fuel economy of a compact car. The acronym RAV4 stand for Recreational Active Vehicle with 4-wheel drive. First distribution of this SUV was more than successful. That particular success paved the way for projects of other manufacturers like Ford and Subaru. First of all Toyota RAV4 2015 has been made to be practical and functional. But for some, this car will not be sporty enough. 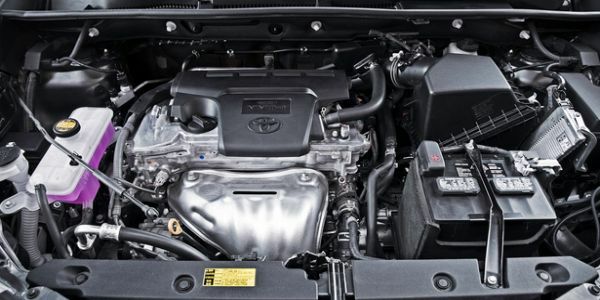 Toyota RAV4 2015 has two engine options. First one is a 2.5 liter gas engine with 176 horsepower that goes from 0-60 in 8.7 seconds with a maximum speed of 108 mph. The second one is a hybrid but it won’t be available until later this year. Naturally, the hybrid version is going to be more fuel efficient. Front wheel drive is already a standard for Toyota RAV4 2015 and AWD is an option. Fuel consumption is estimated on 24mpg for a city drive and 31mpg for a highway drive. Generally the Toyota RAV4 2015 interior is made of very good materials and ergonomics, and even with base LE model, you will get contrasting colors. Entune infotainment system with Bluetooth audio streaming with six speakers, 6.1 inch display and rear view camera are also a standard offer, which is excellent but there is no option for leather at all, which is bad when you compare it with other manufacturers and models. Actually leather has been substituted with some material called Softex, which is not the real thing, but it is close enough. Most important thing for this kind of vehicle should be the driver’s position, which is quite comfortable and well positioned with good back support. The rear is completely updated, with a lot more room for grownups and a bigger cargo space. The more expensive XLE model will even have a dual zone climate control, power moon roof and French stitching for front seats. Even more expensive limited editions will get power liftgate, Softex upholstery, push button start and much more. All versions are going to be equipped with eight airbags and stability control. Toyota RAV4 2015 exterior has been reimagined with more aggressive, sharper lines. There is no rear mounted spare tire anymore. Because of that, the back door is now a swing-up version, so it’s now more easier to load stuff in the back like groceries or whatever is needed to be loaded. The spare tire is now safely tucked underneath the cargo floor. Front and back bumpers are a bit bigger than the last year model. Front part is upgraded with a bit sharper underbite and sharper nose. Other than that, the silhouette of this vehicle is not that different than the previous year model. According to our Toyota RAV4 2015 review prices are going from 23,380 to 31,000 dollars, depending of a trim level. Those prices go head to head with the main competitors like Honda CR-V and Ford Escape. When thinking about purchasing this vehicle, be sure to Google the prices in your surrounding area and check the forums if there are some opinions of people that have already bought the Toyota RAV4 2015. The price for a hybrid version is not yet known.